kickoff at the W.W. Keeler Tribal Complex in Tahlequah. The 2017 Cherokee Nation Angel Project applications will be available starting Oct. 9 for children 16 years old and younger. The donation program provides gifts each holiday season for Cherokee children who live within the 14-county tribal jurisdiction and meet income guidelines. To qualify for the tribe’s income guidelines, applicants must provide proof of income for all household members over the age of 18. For example, a family of three must not exceed $2,127 net income per month, and a family of four must not exceed $2,562 per month. More than 1,700 children received holiday gifts through the program last year. 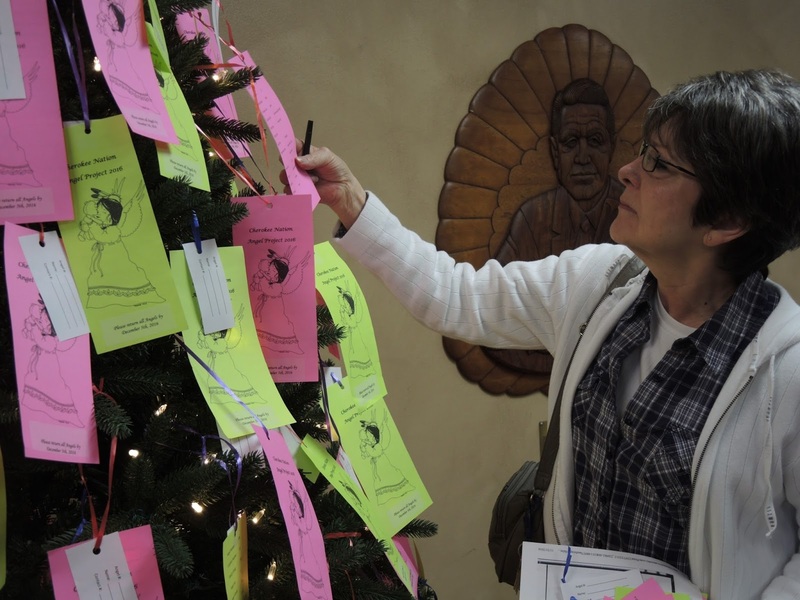 The Cherokee Nation is also currently accepting applications for the Cherokee Nation Elder Angel Tree. The program is open to Cherokee Nation citizens who are 60 years old or older and their spouse or widow. Applications for the Cherokee Nation Elder Angel Tree must be completed with a family or elder advocate and submitted by Oct. 31 to the Cherokee Nation Human Services office at W.W. Keeler Tribal Complex in Tahlequah or any of the field offices in the 14-county jurisdiction. Applications can also be submitted at the tribe’s senior nutrition sites. 10 a.m. to 6 p.m. – Sallisaw – Civic Center, 115 E. Choctaw Ave. Applications for the 2017 Cherokee Nation Angel Tree Project can also be submitted online at https://secure.cherokee.org/angeltree. For more information, call 918-453-6900. For more information about Cherokee Nation Elder Angel Tree, contact 918-453-5627.